Vishal Patel is the Global Managing Director of North America for Duke Corporate Education. A strongly market-oriented leader, Vishal’s responsibilities include overseeing the strategy for North America, managing the overall portfolio of clients in the region and extending Duke CE’s organizational capabilities through strategic partnerships. He previously served as Global Managing Director for Asia and the Middle East. 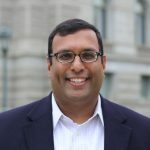 Vishal has worked with a broad selection of global and super-regional companies in mining, financial services, manufacturing, telecommunications, media, professional services and consumer packaged goods, managing and delivering programs for leaders in Europe, Asia, North America, South America, and Africa. Vishal joined the Duke CE South Africa team in June 2009 as a Director and was appointed Managing Director for South Africa in 2011. Vishal’s responsibilities focused on strategic planning, client relationship management, teaching, curriculum development, and project management. Vishal has a depth of experience with leadership development and education that began as a teacher in New Orleans with Teach for America – a selective program which places high achieving collegiate leaders in the most under-resourced and under-performing school districts in the US. Vishal completed his BA and M. Ed. from the University of Virginia and a MBA from Duke University’s Fuqua School of Business. In his spare time, Vishal is an avid reader, traveler, and sports fan – who developed a greater appreciation of cricket and rugby while living in South Africa.